Warrior Will Mesteth holds up the championship trophy. The Warriors’ bench races out onto the court in celebration. 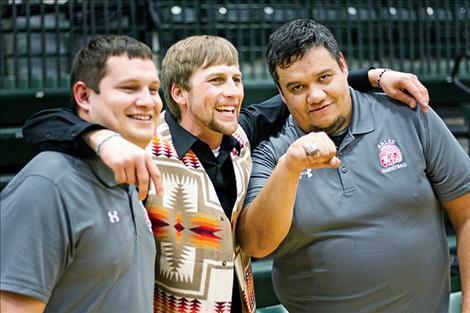 Warrior coaching staff shares in the celebration. 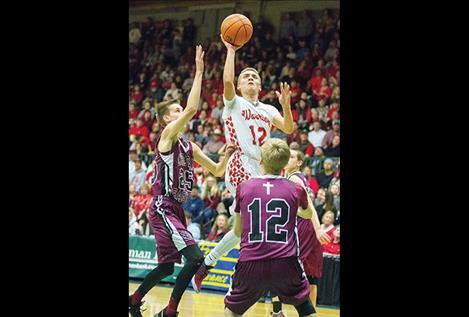 Arlee Warrior Greg Whitesell scores against Manhattan Christian. 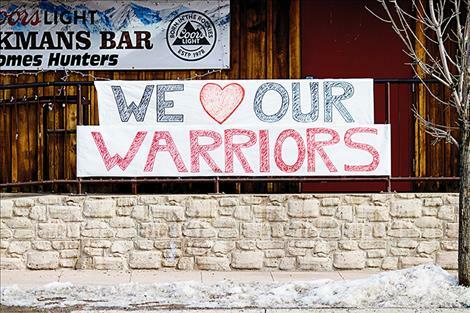 Fans cheer on the Warriors. 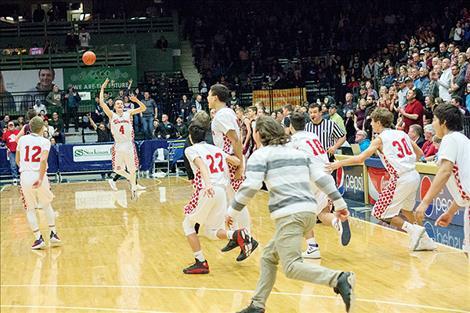 BUTTE – Dribbling out the last few ticks on the game clock, senior Phillip Malatare chucked the basketball toward the rafters of the Butte Civic Center setting off a court storming by the bench as the Arlee Warriors repeated as the Class C boys basketball state champion on Saturday night by defeating the Manhattan Christian Eagles 66-58. 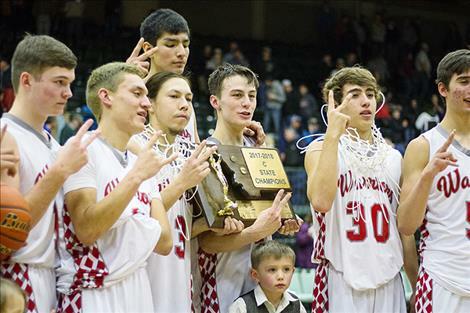 Capping a 26-0 season, the first in Arlee school history, the Warriors pulled off the rare feat by becoming the third team in Class C history to repeat as state champions since Kremlin-Gildford went back to back in 1998-1999 and Heart Butte in 2000-2001. 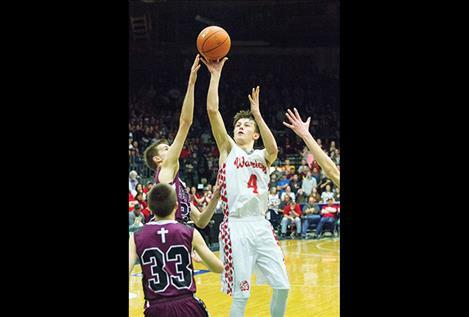 Although, double-digit blowout wins have been the norm this winter, the state tournament wasn’t quite the cakewalk for the Warriors. After the opening quarter in the first round on Thursday, the Warriors found themselves all knotted up at 14-14 with the Belt Huskies and headed into the locker room at the half with a slim 27-24 lead. Arlee outscored the Huskies by 15 in the third quarter to pull away with the 58-37 win. 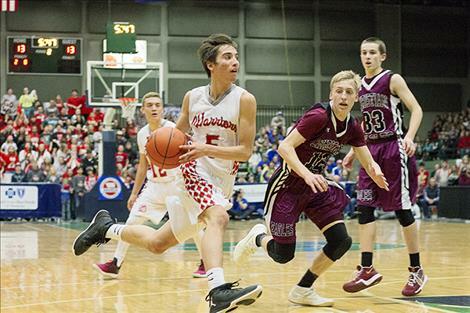 Will Mesteth scored 15 points for the Warriors, while Greg Whitesell added 12 points and Malatare contributed 12. In the semifinal on Friday, the Scobey Spartans jumped out to a quick 22-15 lead after the first quarter and held a 39-33 advantage over the Warriors at the half. 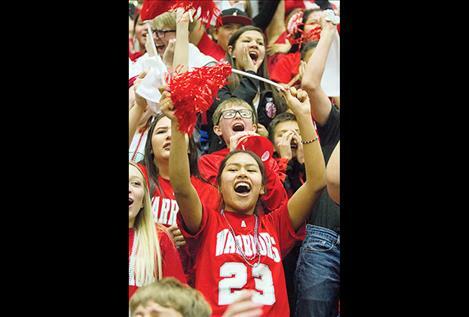 During the third quarter, the Warriors ratcheted their play up another notch, to a level Scobey simply couldn’t match and outpaced the Spartans 22-6 to claim the third quarter lead. 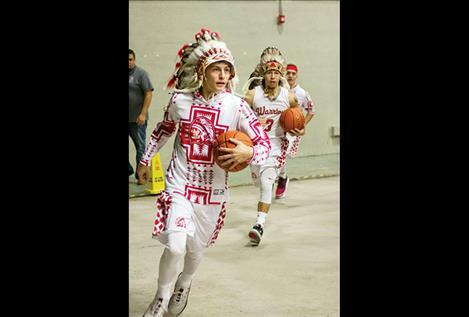 Fending off a Spartan late fourth quarter run, the Warriors held on to the bracket advancing 76-71 win, while handing Scobey its first loss of the season. 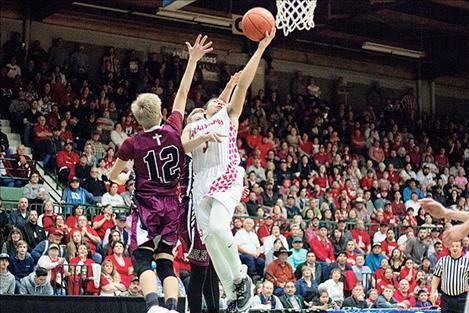 Arlee was led by Malatare’s game-high 28 points, 13 rebounds and ESPN Sports Center highlight reel-like plays. Three other Warriors reached double figures on the evening, Mesteth finished with 18 points, Whitesell had 14 points and Lane Johnson had 11. 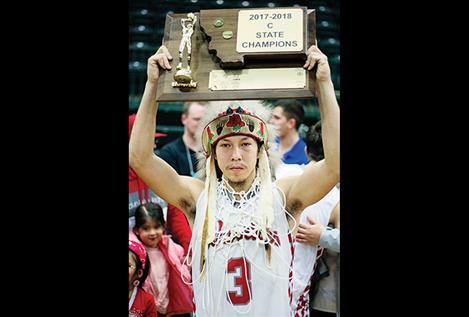 In front of a Civic Center capacity crowd of 6,000-plus fans on Saturday evening, the Warriors made their third straight Class C boys basketball state championship appearance. 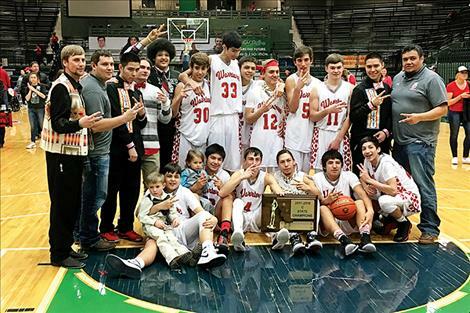 They defeated Manhattan Christian 71-67 last year for their first ever state title, having fallen the previous year (2016) 95-73 to Box Elder. For the first eight minutes of the ballgame it was intense back-and-forth action which ended tied at 10-10. The second quarter was much of the same back-and-forth action as the first quarter, until Arlee broke a 19-all tie late in the quarter with a 7-0 run, which culminated in Mesteth sinking a buzzer beating 3-pointer that gave the Warriors a 26-19 lead at the half. Manhattan Christian quickly grabbed the momentum in the third quarter with a 12-3 run, which erased the Warriors seven-point halftime advantage and gave the Eagles a 31-29 lead. The Eagles lead had a very short life span as Mesteth’s back-to-back 3-pointers from the corner found the bottom of the net giving the lead and momentum back to the Warriors. Although the Eagles were able to keep the game close and bring the score to within two points during the fourth quarter, the Warriors were able to out-hustle the Eagles to keep the game out of reach, securing the championship victory. Malatare and Mesteth, both seniors playing in their final game for the Warriors, sparked the win. Both led all Warrior scorers with 18 points, while Isaac Fisher added 14 points and Johnson chipped in 12 more. 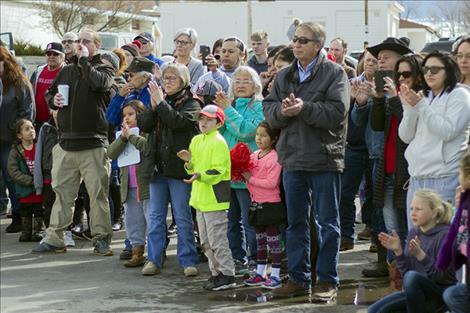 On Sunday, the Warriors returned to Arlee and were greeted by a victory parade that snaked its way through town. 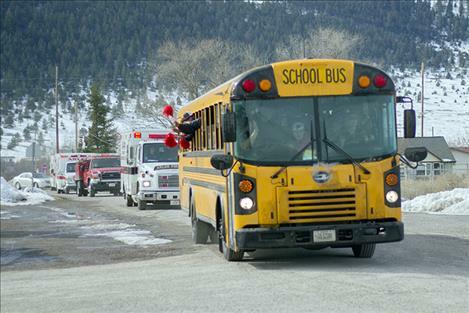 It started at the Grey Wolf Casino and ended back where it all began at the gym. Arlee: Will Mesteth 15, Phillip Malatare 10, Lane Johnson 8, Greg Whitesell 12, Isaac Fisher 4, Chase Gardiner 6, Bill Fisher 1, Lane Schall 2. Belt: Keagan Stroop 15, Troy Hennes 9, Trey Heitzman 10, Brayden Haugrose 3. 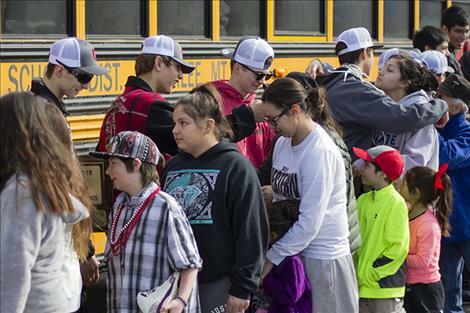 Scobey: CJ Nelson 22, Riley Linder 14, Caden Handran 9, Dylan Myers 5, Jeremy Handy 12, Parker Cromwell 7, Martin Farver 2. Arlee: Will Mesteth 18, Phillip Malatare 28, Lane Johnson 11, Greg Whitesell 14, Isaac Fisher 1, Darshen Bolin 2, Lane Schall 2. Manhattan Christian: Matthew Amunrud 13, Parker Dyksterhouse 2, Caleb Bellach 27, Josiah Amunrud 7, Ryan Busch 4, Caden Hill 5. Arlee: Will Mesteth 18, Phillip Malatare 18, Lane Johnson 12, Greg Whitesell 4, Isaac Fisher 14.